Kilcunda is a town where the rolling green hills of rural Gippsland meet a rugged coastline of long sandy beaches, surging surf and the Bass Strait seas and The Kilcunda Ocean View Hotel captures it all. All mains (except pasta dishes) are served with chips and a choice of seasonal vegetables or salad. Gluten free and Lactose free options are available. The Killy Pub is pleased to introduce our new Head Chef, Ivan Sanchez Pirez. Originating from Havana Cuba, Ivan has added some authentic South and Central American flavours to the menu. With specialities on the menu like La Pampas - Argentinian BBQ Chicken and Cuban-style Pork Ribs, coupled with your pub favourites - local gummy flake, chicken parma and lemon pepper calamari, the kitchen uses fresh, local produce. At the Kilcunda Ocean View Hotel the menu caters for everyone, there's pasta, seafood, meat, vegetarian, vegan and children's meals. Gluten and Lactose-free options are also available. 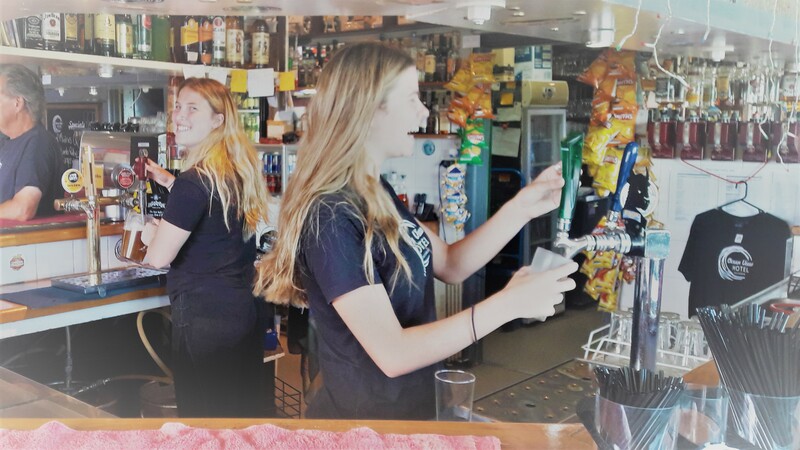 There's a local focus at The Kilcunda Ocean View Hotel, not just the pub's friendly staff but there's locally-sourced wines and Australian beers. There are craft beers on tap and by the bottle and a large selection of Gippsland wines are available. Whet your appetite by the sea on the front deck or by the fireplace in the lounge bar. Local musicians are on the stage every week with acoustic Sunday sessions. There is a piano bar and regular live bands in the lounge bar. Relax on the front deck for summer sipper sessions. As the weather cools, cosy-up in the Ocean View Bistro or in front of the fire in the lounge bar. Offering 180 degree views of the ocean from its verandah, The Kilcunda Ocean View Hotel lives up to its namesake. Known as 'The Killy' to locals, the hotel is famous for its ocean views, incredible sun-sets and great pub meals. Kilcunda is also the trail head for two famous walks – the George Bass Coastal Walk to San Remo and the Bass Coast Rail Trail to Wonthaggi and Phillip Island. And sharing all this with tourists, holiday-makers and friendly locals sees The Kilcunda Ocean View Hotel the perfect stop-off for lunch, dinner or a night out. Treat yourself to some local warmth in summer by the sea, in winter by the fireplace at The Kilcunda Ocean View Hotel. The Killy Pub is now in Summer mode and will be cooking 7 day a week. Lunch - 12pm to 2.30pm. Dinner - 6pm to 8.30pm. Bon appetit! Pub open 11.30am to close daily. Bottle sales over the bar. Private functions available all year round.